The past 24 hours — and two years, really — have not been kind to Facebook. 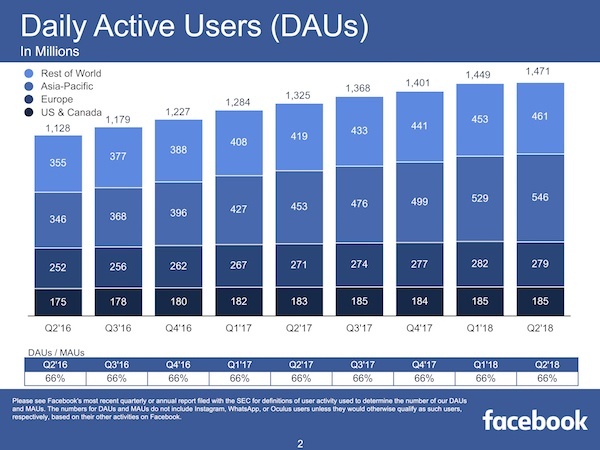 In case you missed it, the social media giant released its Q2 2018 earnings report yesterday, where it was indicated that user growth has all but ceased completely in the U.S. and Canada — and fallen in Europe. Overall, the company missed on estimates for its quarterly earnings — for the first time since 2015 — and as soon as the report was released, its stock price began to drop. But things only became worse during the earnings call, when executives warned that growth (in both user counts and revenue) would continue decelerate in the third and fourth quarters, and perplexed analysts repeatedly asked for answers. By the time the call ended, Facebook’s stock price dropping over 23% by the time the call ended. And overnight, the company lost $123.4 billion — or nearly 20% — of its value. 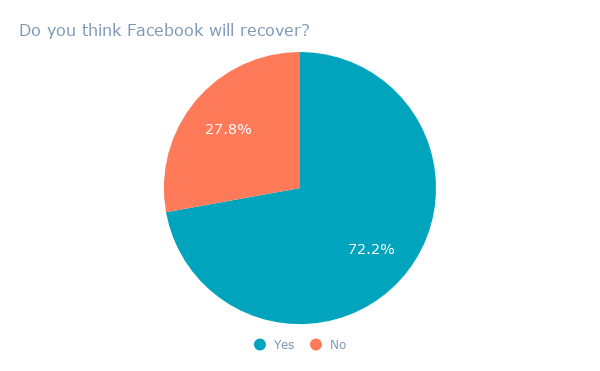 But according to our research, people aren’t really surprised — and they expect Facebook to recover from this latest (significant) stumbling block. 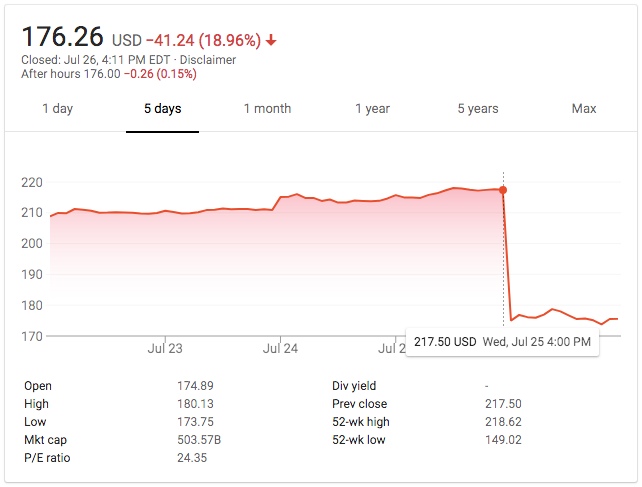 After Facebook announced that its growth and earnings slowed last quarter, the company’s stock lost over 20% in value overnight. Are you surprised that Facebook’s growth is slowing down? 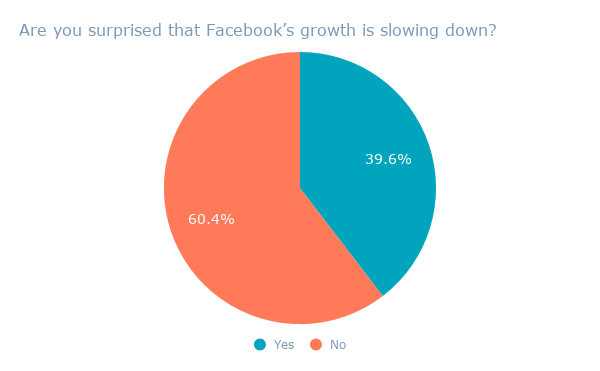 Globally, 60% of respondents said they were not surprised by Facebook’s slowed growth. Data collected with Lucid. Sample size: 695. 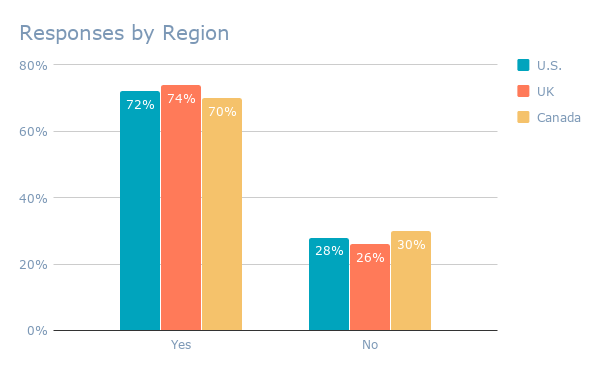 When broken down by region, respondents from the UK were the most surprised, and the least so in Canada. Do you think Facebook will recover? Globally, nearly three-quarters of respondents — 72% – said they do believe that Facebook will recover from the missed earnings and subsequent loss in value. Data collected with Lucid. Sample size: 633. 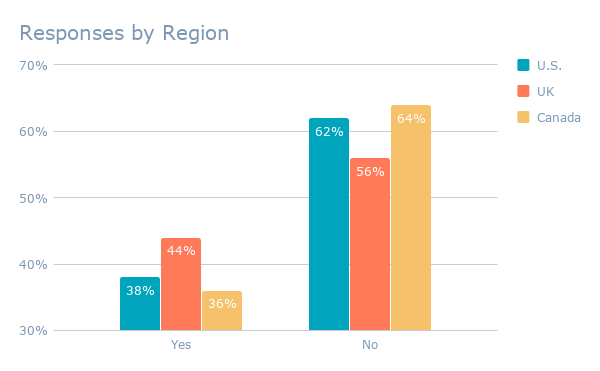 When broken down by region, respondents from the UK were both the most optimistic about Facebook’s recovery, with Canada showing the most pessimism. The hours following the earnings call have struck quite a debate among analysts and journalists alike. Was the miss on estimates — as well as the overall fallout from the earnings report — the result of “years of privacy controversies finally [catching] up with Facebook“? Or is Facebook simply running out of people to reach in its largest market — the U.S. and Canada — leading to a plateau in user growth? Many believe that the two aren’t mutually exclusive. Could the slowed user growth could be the result, for instance, of people fleeing from the platform after months of scandal upon scandal? Facebook has been making critical changes to its platform — even prior to March Cambridge Analytica revelations about the misuse of personal data — that the company warned would either reduce time spent on the site, or ad revenue (or both). That began with a January News Feed algorithm change that would prioritize content from users’ friends and family over that from brands. The change was largely in response to scrutiny over the weaponization of Facebook by foreign actors to spread misinformation and ultimately influence the 2016 U.S. presidential elections — by emphasizing content from one’s personal network, the visibility of possible misinformation or divisive content would (ideally) be suppressed. Since then — especially after the Cambridge Analytica revelations — Facebook has only continued to make changes that reduce the visibility of certain types of content and, perhaps as a result, reduce the amount of time spent (as well as users) on the network. Saying for certain whether or not Facebook will recover from this significant loss in value is tricky. Experts are falling on both sides of the issue, and for good reason. The company is still facing a high degree of scrutiny over things like data protection and election integrity, which both have an impact on user trust (and, therefore, potential user growth). But as HubSpot CMO Kipp Bodnar noted after yesterday’s earnings call, the company also still has room to grow. “The core network can reach saturation in markets like the U.S.,” he said at the time, “but it can still grow in emerging markets,” as well as through its portfolio of apps like Instagram and WhatsApp — both of which serve as sources of ad revenue. 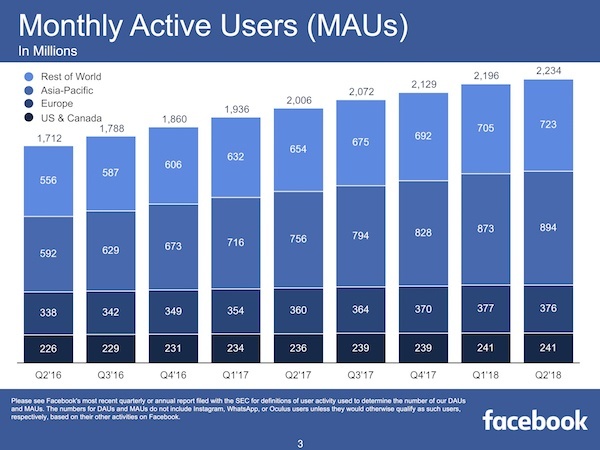 Eventually, Facebook could run out of new users to reach, especially in areas where slowed user growth could also correlate with a declining population. But throughout the call, Zuckerberg emphasized the company’s refusal to compromise on investments in new products and innovations — despite its investments in better security. We’ll be keeping an eye on these innovations and trends alike.